This post originally appeared on The BOMA Project’s blog and is republished with permission. Accountability for nonprofits means many things: financial transparency and disclosure, to show that they are good stewards of the funding they rely on to execute their programs. Accountability to their partners who are helping them scale or innovate in their space. Accountability to their employees to provide safe, professional work environments. And, most importantly, accountability to the populations that they serve—are they delivering on their mission? Data is essential to achieving these measures of accountability, but collecting not only accurate data but meaningful data is an ongoing challenge. It is easy to understand the urge to collect as much data as possible, but without a clear focus on what is essential to program execution it is easy to get off track. Organizations need to ask the right questions, then use that information to guide execution and delivery of their programs. To uphold this standard of due diligence, nonprofits are increasingly relying on CRM (customer relationship management) software such as Salesforce, to manage beneficiaries, visualize and report on performance, and measure impact across a portfolio of project and grants. Having a robust data collection and management platform helps nonprofits be clear in their goals, progress and outcomes, and prove their value propositions. Connecting a nonprofit organization’s mission with outcome data and solid metrics is the key to success as well as validating funders’ support. But numbers alone don’t tell the whole story—understanding the data’s context helps an organization more fully understand the landscape in which they are operating. Sharing data and demonstrating the ability to find the meaning in data to achieve the best outcomes is what gives funders and partners confidence in a nonprofit’s ability to deliver. Nonprofits need to ask themselves how the data they gather is going to support their program and iterate to achieve success. Are we achieving what we set out to do? How do we know? Are we getting a complete picture of our participants’ lives? What equilibriums are we trying to change? Particularly for organizations that operate in areas with little infrastructure, collecting and evaluating data to inform program decisions presents its own set of challenges. 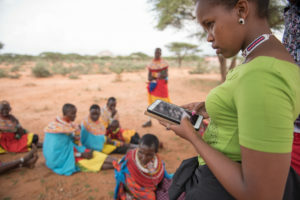 Having a robust technology platform can make the rapid collection and uploading of data possible, so program decisions can happen in real time, allowing orgs to pivot and respond to the needs of the communities they serve. At the BOMA Project, our mission is to help women in the drylands of Africa overcome extreme poverty. But our program also takes into account and addresses the multiple, interlinking causes and consequences of extreme poverty, such as lack of access to education for girls and women. The remote regions where we work can make submitting data difficult. In partnership with Vera Solutions and with a grant from Salesforce.org, we developed a proprietary cloud-based data platform called Performance Insights, which allows our field teams to enter and upload data quickly for real-time evaluation and response. The latest iteration includes the ongoing development of Project Scorecards which help us measure progress against multiple benchmarks towards graduation at the end of 2 years. We can see at a glance how our participants are doing and pivot our program actions to ensure success. We can also learn what information we might not be getting that can help us better understand our progress and inefficiencies. We recently launched a Girl Child Campaign in the communities where we work to promote the importance of sending children, particularly girls, to school. Our Project Scorecards allow us to see trends in data that show where we are not meeting benchmarks. Refocusing the data collection—what questions are we not answering, what factors are we not figuring into our matrix?—allows us to get a better understanding of the obstacles and adjust our programming to achieve our goals. What is happening in the communities where we’re seeing low percentages of enrollment? Digging deeper into the data collection process, we discovered that in one community, when participants had been asked if their children were in school, they took the question to mean “Are your children in school at this moment?” The data gave us a snapshot that looked alarming, and led us to ask deeper questions to further refine our data collection approach. Instantly seeing flags go up in the data pipeline allowed us to adjust and act quickly. Building the tools and resources to collect and evaluate vital data is essential to delivering a high-quality program. But to be fully accountable, to beneficiaries and stakeholders alike, organizations have to dive deep into what the metrics really mean, and translate that knowledge into action.